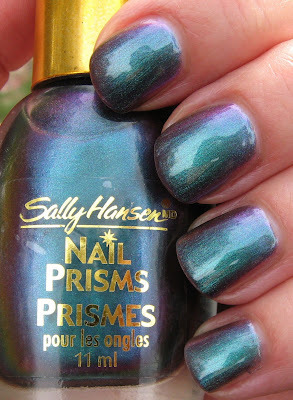 One of my favorite Nail Prisms by Sally Hansen is Turquoise Opal--this is probably one of my favorite polishes, period! 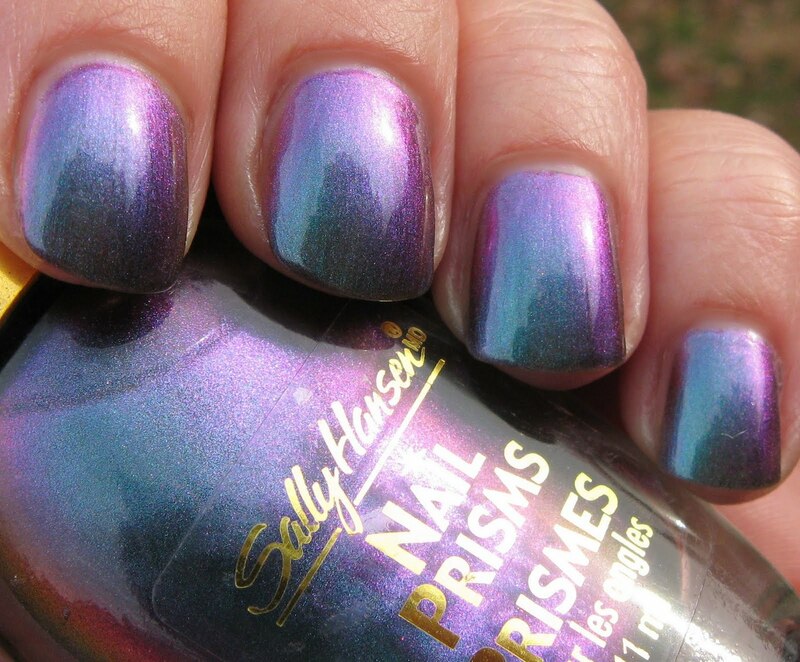 Behold the beauty of this purple/turquoise shade with an ultra-strong duo chrome. If you love duo chromes, this is one that does not disappoint. All of the photos except the last two were taken outdoors under cloudy skies. The last two were taken indoors with a flash. Turquoise Opal looks different with every move your hand makes, shifting from various shades of purple to turquoise, lavender to fuchsia, and probably a couple of other colors that I'm forgetting to mention. This shade is discontinued, but I vote for Sally to bring back a whole new round of shades from this line! I went through about 5 bottles of this back when it was out...I didn't save any at all :(. I hope these are reissued at some point, so I can squirrel away a bunch! I second you in your vote!!!! 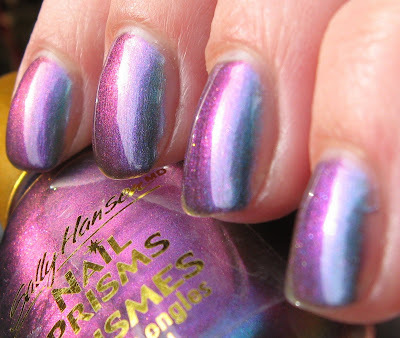 I'd love to see more of these ones, because the colours are just perfect, and the duochrome effect is wonderful! If there's something I really like in a nail polish is a good reflection! Ohhhh I need this color! NOW!!! Wow! Amazing. SH definitely needs to bring this and other gorgeous older shades back. 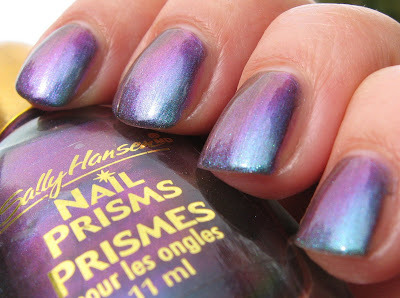 I have some of the nail prisms and loved them, but this one is amazing. I sincerely hope SH brings this one back! I found a bunch of these in Dollar Tree! Now I will have to find this one! This is awesome! They really should re-release this line or make a new line similar to it. That is really gorgeous. I've never seen this polish. Looks amazing on you. I have some but I don't think I have this one. Mary, I'm kind of new around here but I look forward to your new posts everyday! I'm in awe of your perfect polish applications. I just don't know how you do it! And everyday you turn up with a new color that I adore! You inspire me. Great duo-chrome. 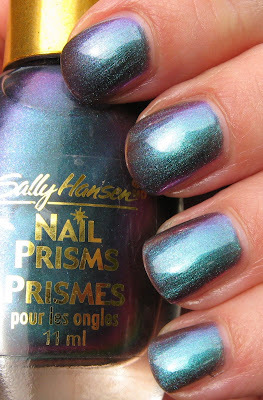 Ah vintage sally hansen! Ohmygosh I neeeed this one! So awesome! My Leetle Nails~yes, lots of colors to pick from in this one! Blu11~*wipes the drool off of your chin*!!! 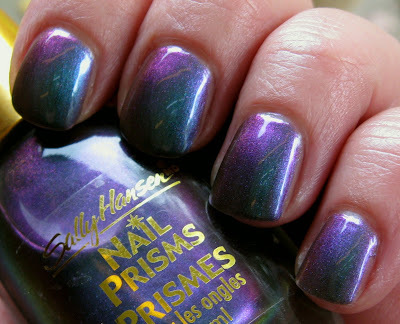 Melli~of I know, when I think of the polishes I used to have...I don't know why I got rid of them over the years. I doubt they'll ever re-release these, but we can hope. lolaa~it's a beauty, for sure! I took so many photos of this one because it looked different in every one. MissMarlboro~isn't it gorgeous? Not all of the Prisms are quite this dramatic--some are, but some are not. I'd love to have every one of them! Jackie S.~yes, yes you do!!! 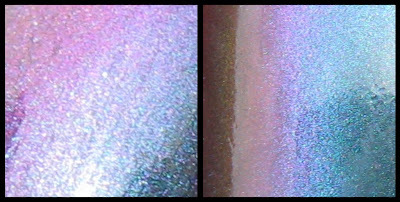 Ice Queen~Sally Hansen really has a huge range of colors and finishes. Current and discontinued. 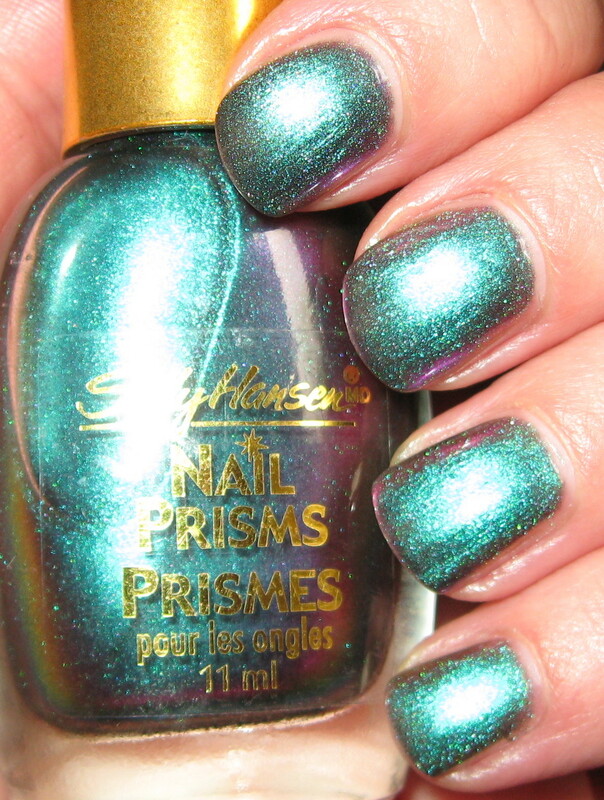 Phyrra~I love the Prisms! Can you imagine the insanity that a re-release of these would cause? Crlsweetie912~I know they're making the rounds at Dollar Trees lately and if you ever saw this one, that would be a real find! Serena~I'd settle for something similar from them, that would be perfect! Lucy~you'd love this one. It's very entertaining to watch :) Happy Birthday! kittypolishnbags~as much as I love the new collections and polishes that come out from all of the manufactureres, I seem to get almost more pleasure out of the older ones! Starryxuan~glad you like it! It's a stunner. 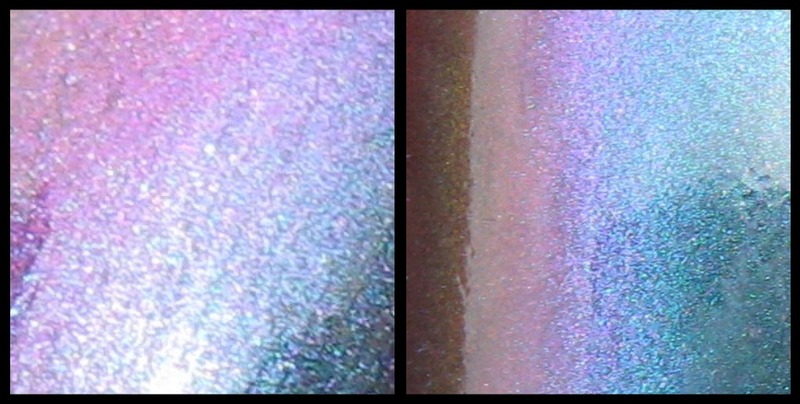 Beata~this one is probably one of my strongest duo chrome polishes. Vintage anything makes me happy, but nail polishes even more so! Hi Mary: I know what you mean about this being your favorite nail color, it looks gorgoeus on your nails. Love the Prism Turquoise Opal, and the way it changes color with every move you make. It's quite amazing! 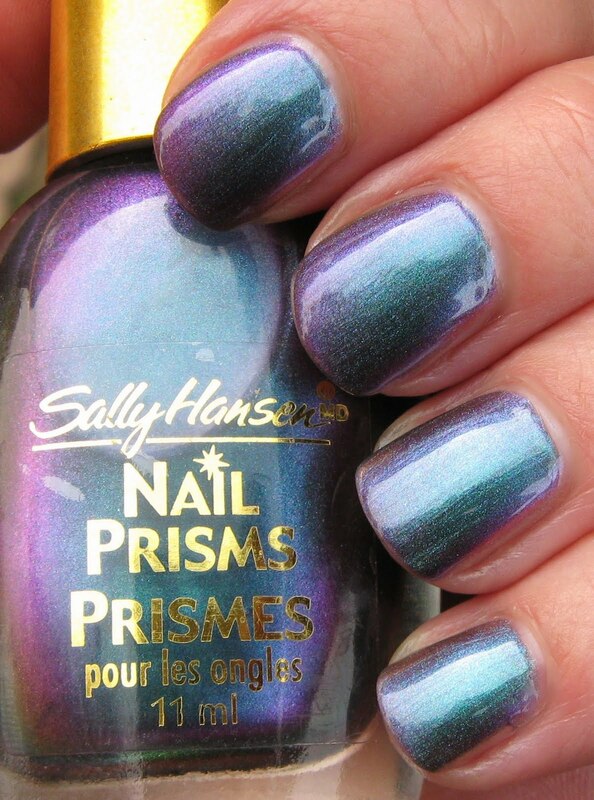 Sally Hansen does it again with this unique nail polish, Love it. Gorgeous! 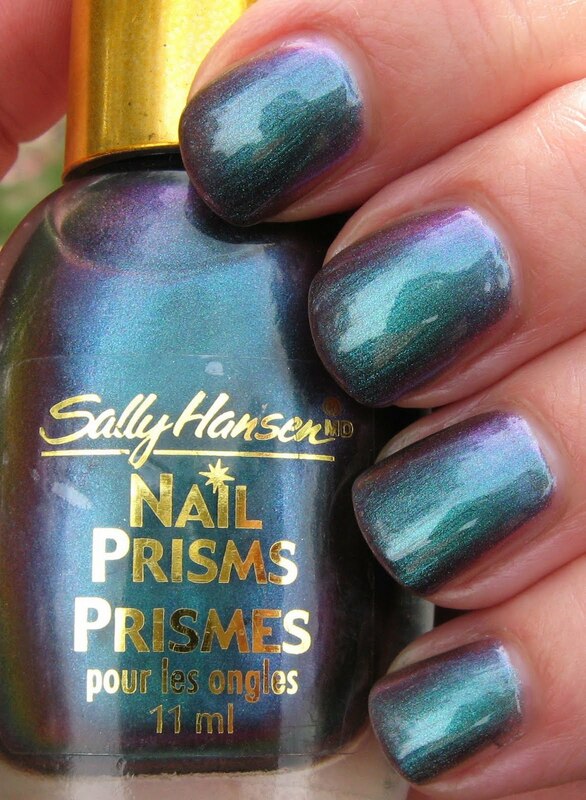 I really wish Sally Hansen would bring the Nail Prism line back.